Well hello! That is the only way I know to begin this post, because it’s been quite some time since I’ve posted. About 29 times or something like that I was getting ready to write, but then I would get distracted by something and do something else. Like the tv or my phone or Facebook. A lot’s happened in the last few weeks! So much, that I don’t know where to begin. So I’ll just share a few snapshots of exciting things that happened. Ok, some things aren’t that exciting, but whatever. I’m going to go back kind of a ways. Like a month. Because a lot’s happened. July 18: Peter’s car broke down. Yaaaaaaaaaaaaaaay. July 20: Peter cut his foot open on a zebra mussel when he jumped in the Fox River because he was going to die of heat exhaustion. 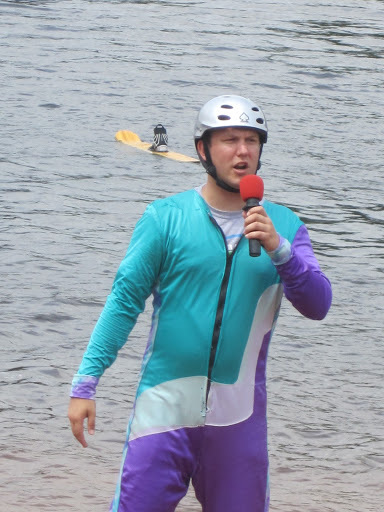 He was announcing for a ski show. A little girl came up to me and said, “Peter cut his foot. It’s bleeding a lot. He said is hurts.” First, I whispered wuss under my breath. 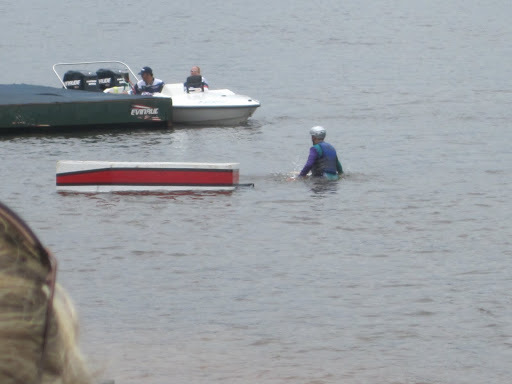 Then I saw someone go down to the dock with a First Aid kit. Then Peter could hardly walk to the car. Then he was really shaky and fidgety on the ride home. Then we went to Walgreens. And his debit card got denied. I got annoyed and swiped my card. Little did we know that this was the beginning of me being his sugar mama. July 22: Peter called me. You need to come to the gas station. My card got denied again. I swiped my card. His debit card number got stolen. In Florida. He was missing hundreds of dollars. Yaaaaaaaaaaaaaaaay. 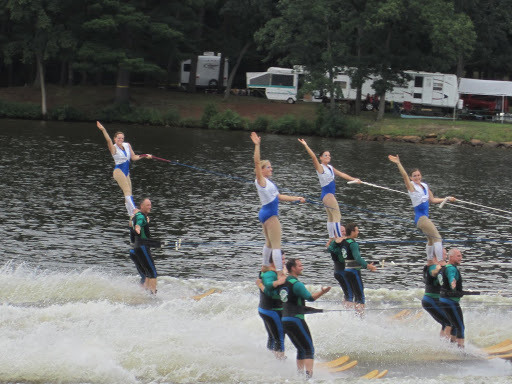 July 22-24: State Water Ski Competition. We stayed in a hotel. Peter still didn’t have a debit card. Swipey swipe swipe my card. Peter’s foot was also cut. And sore. So he was a little crabby. That was fun. Look at that intense announcer’s face. Look at how cool he thinks he is. 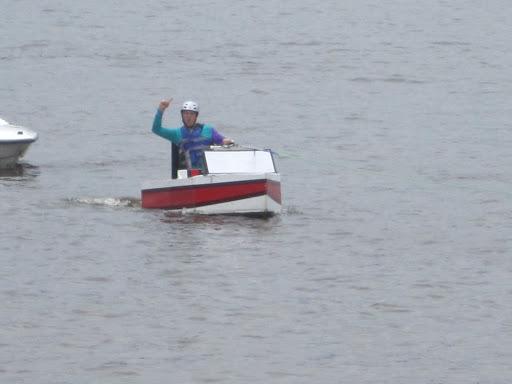 But it was really funny when his boat capsized. July 30: Travis and I bought our plane tickets to NYC. YAY!!! September 14-18! EXCITING! I CAN’T STOP SMILING!! July 31: I got pulled over. But only got a warning. I only started to cry when he told me that I was getting a warning. Tears of joy. Then I called Peter, but I called him at the WRONG time, because I was like, sobbing, and I think he thought I was going to get in a car crash. But I didn’t. I seriously have no idea what my problem was. 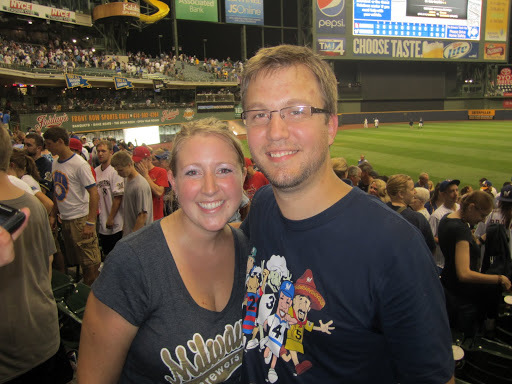 August 1: Went to the Brewer’s game with my fam. It was so effing hot and humid. That’s why I’m glistening. Look at Jenna’s baby! Only a few more weeks to go! But we were late to the Brewer’s game. Because someone decided to buy a car. So we sat at the dealership for 2 hours and mostly waited, but Peter signed a few papers. Then we realized that he couldn’t take his new car home that day, because he needed to sign more papers, and someone was losing patience (OK, it was me.) 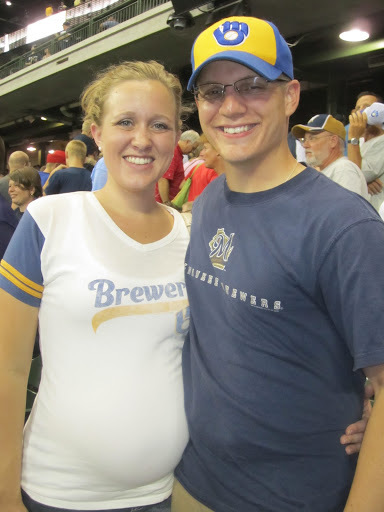 because someone wanted to see her family at the Brewer’s game. August 5: Still no debit card for Peter. So I was still swipey swipe swiping my card away. But that’s what you do for the love of your life. And you don’t complain about it either. You just make sure to keep receipts for hotels and ask very nicely for checks. 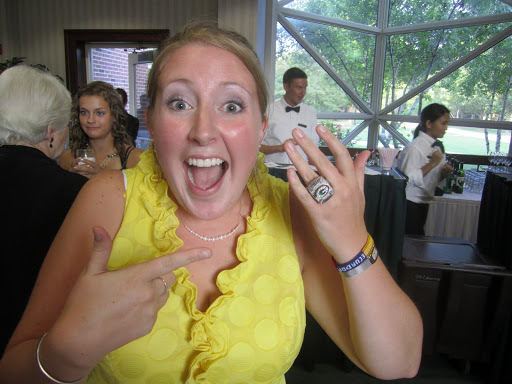 August 6: I got to wear a real live Super Bowl ring. 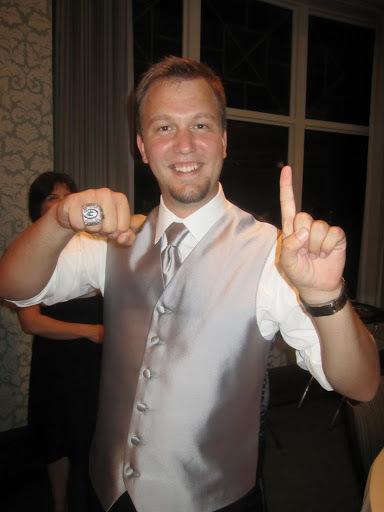 And then Peter got jealous when I showed him my picture of the Super Bowl ring, so he hunted down the priest that had it and tore the ring off of his finger so that HE could be cool like ME and have a picture with the Super Bowl ring. Oh, I almost forgot. 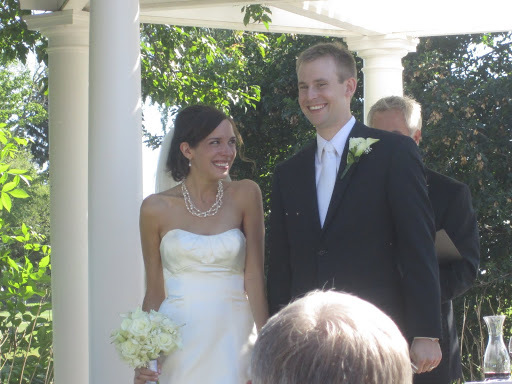 We were at our friends’ Craig and Katie’s wedding on that day. Don’t they look fabulous? I cried because they were so beautiful. That’s why Peter looks so snazzy in that vest. He was a groomsman. And he cleans up very nicely. So that made me happy. 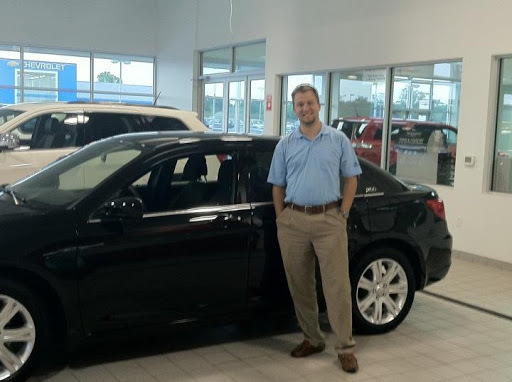 August 8: Peter got his new car! And then he took me for a ride in it, and then I thought he was proposing to me, but it was really just a small square box full of candy. So that was embarrassing. August 11: Peter switched banks. And got a new debit card in TWO DAYS. I was really happy. But mostly because his new debit card is pretty and blue instead of a Green Bay Packers debit card. August 12: Peter was mad because he had to wake up at 4:30 in the morning. But he had to wake up early because he was on tv. Check it out. 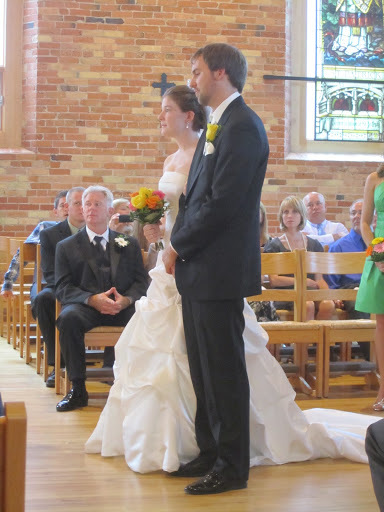 August 14: Wedding #4 of the year. Headed down to Madison to watch my dear friends Katelynn and Jordan get married. 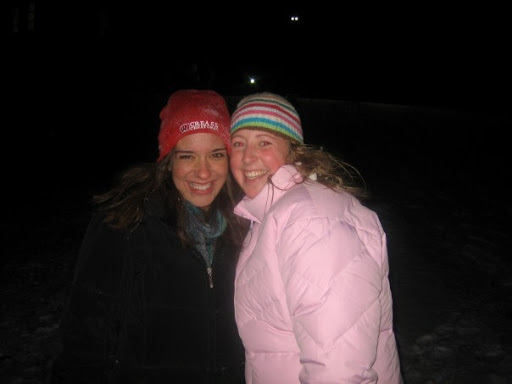 They were some of my first friends when I went to college. Jordan used to be really mean. This is Jordan giving me a wet willy. Freshman year. Katelynn was always nice to me. She said that I was her favorite freshman. shoved our faces in the snow? I have this video of Jordan hitting Katelynn and I with those things that are filled with air and you bang them together at sporting events. But I couldn’t find it. I’ll find it sometime though. Then, years later when Jordan stopped being mean, they fell in love, and then they got married and it was wonderful. Yeah. I cried at this wedding too. Lots of crying lately. August 17: I found out that I’m going to Bogota, Colombia for a conference for work. So that’s exciting. And that brings us all up to date. I’ll try and remember to write more about my life. I have good intentions, and then I do other things like eat an ice cream, or chew on bubble gum, or text somebody.